Dr. Goldie Byrd is the Executive Director for the Center for Outreach in Alzheimer’s Aging and Community Health at North Carolina Agriculture and Technical State University in Greensboro, North Carolina. of the Department of Biology, as the Nathan F. Simms Endowed Professor of Biology, and the Dean of the College of Arts and Sciences. Dr. Byrd conducts multidisciplinary research on the Genetic Susceptibility of Alzheimer’s disease in African Americans, with partners at the University of Miami, Case Western Reserve University, and Columbia University. Her research in the genetics of Alzheimer’s disease in African Americans has been recognized both nationally and internationally by the Alzheimer’s Association and the National Black College Alumni Hall of Fame. 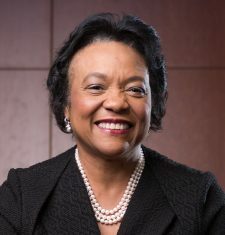 She secured over $3 million from the Merck Foundation to provide initial funding for a Center for Outreach in Aging, Alzheimer’s and Community Health at NC A&T. The Center is located in the heart of the largest Historically Black University, and provides community research, education, outreach and training, particularly among vulnerable populations. Dr. Byrd joined the African American Network Against Alzheimer’s as one of its Founding members. Goldie Byrd, PhD, received her Bachelor of Science degrees in Professional Biology and in Biology Secondary Education at North Carolina A&T State University. She received her PhD at Meharry Medical College in Microbial Genetics. She completed post-doctoral work at Meharry Medical College, the University of North Carolina at Chapel Hill and Duke University. Dr. Byrd was previously a faculty member in the biology departments at Tennessee State University and North Carolina Central University, and more recently an adjunct Assistant Professor at Duke University.